A few friends & I were recently discussing who should be the next England manager ? I found myself, involuntarily, saying ....."Kang"
I can't speak for everyone, but I know a surprisingly large number of kids (nephews, friends' kids, other family, etc.) under ten that think Iron Man is the bees knees. I'm all like, "what about Spider-Man, Captain America, Batman, SUPERMAN, for crying out loud?" And they're all like, "Iron Man!" and then they make a bunch of sound effects and run around crashing into things like a bunch of drunks. I realize that's anecdotal, but I think that Iron Man might be a stronger presence for the younger generation than he was for mine. Even in the episodes of EMH that I've seen, Iron Man seems to be the top dog. I think he's made the jump for the younger kids. As for rereleasing A-Listers over and over... I for one am for it, especially where it gets us B-, C-, and D- Listers. I just wish, and this is especially true for Cap, that there were more variation in the costumes selected. I am a little sick of the SAME costume over and over again, especially when there are good costume variants out there. That said, I'm looking into a way to make Wave 50 a collector-appreciation wave. Marvel Minimates turn 10 in 2013, and the 50th wave should fall in that timeframe. I look forward to hearing what you guys come up with. I think that who DST/Marvel consider A-List is based more on their overall degree of popularity and degree of "cultural recognition", not which comics selling best. If that shifts or changes in any way, I'm sure the minimates we get sick of seeing will also change. How many Deadpools have we seen this year as his popularity has become unavoidably apparent? Had minimates existed in the early 90's, we'd be buried under a pile of Puishers I'm sure. Who knows, Hawkeye may prove the breakout star of the Avengers movie and suddenly be everywhere for the next few years, and then we'll be askin' for them to back off the Hawkeye mates in 2014. Fame is fleting, obscurity is forever. And if I weren't hopelessly osessive, I would have walked completely ages ago. And even still, like you Rob, most of my reading comes from what others buy and lend me to read. (which is why I'm always just a little behind in my reading) If a digital subscription was cheaper, I might go that route. But for the craptastic stories they are producing, monthlies are just too much money to justify buying like I used to. But the fact is I am obsessive and can't help wanting to know how the story "ends" so to speak. On a simialr note, my kids don't read comics. One, there are darn few kid friendly titles and two those there are suffer from the same overpriced for the value that keeps their father from buying more. My oldest would rather spend his money on used paperbacks than comics. My youngest would rather have the toys. What they know of who Daddy's minimates are come from recent movies, cartoons like SHS and EMH, and games like Marvel Ultimate Alliance. (and Daddy's "stories") So ironically they are HUGE fans of Marvel comics characters, but have little intrest in comics. My comics buying habits have completely changed over the last three/four years... I used to be an every-Wednesday guy; now I don't even buy new comics any more, but have completely switched over to trades. And once you've done that, it's a small jump to waiting until you can find the trades cheap. The sad truth is that today's comics aren't worth three dollars, much less four. Moreover, I don't think either Marvel or DC has any idea how to sell comics that aren't driven by stunts or gimmicks. As for kids comics, though, my daughter is four years old and she loves Tiny Titans. LOVES them. So there's still hope. I quit going to my Local Comic Shop after many years of business because I was tired of the drama from the owner/manager/workers that they had amongst themselves. Too busy with each others heads up their asses and not worried enough about getting pre-orders for comics right. Went to http://www.dcbserivce.com/ and haven't looked back since. Everything is roughly 30-40% off every month. They're fantastic, ship securely for a flat-rate of $6.25 with weekly/bi-monthly/monthly shipping. As for comics today not being worth the money, there are several series out there worth cover price, easy. Seek out "The Sixth Gun" by Oni Press, off the tip-top of my recommendation list. "We sure do appreciate all you collectors of Cap, Wolvie, Thor, and Iron Man variants!" Seek out "The Sixth Gun" by Oni Press, off the tip-top of my recommendation list. I'll second that. It's a western with horror, like Hellboy with horses. Kinda. And someday I'm going to do a poll on the forum about how many of us are lapsed comic readers vs. active comic readers. So, anybody got pics of the Best Of wave yet? I'm going to hit up my new local tomorrow after work, but I',m eager to see some pics before then too. I was really hoping there'd be some pics on DST's Facebook or somethin', but I guess in all the Toyfair hubbub it got forgotten. S'okay, one more day to find out if that Thing is THE Thing for me. Sorry, never got packaged samples. Or packaged pics! No apologies neccessary! Ya didn't get 'em sent to ya, so that's no way your fault. I'm just dyin' to see if the Thing's hairpiece and face colors finally match. Sorry I'm being such a nut about him! I'd say I'm still an active comics reader... I mean, I read comics all the time, and relatively new stuff. I just don't buy them when they come out, and (since I'm already waiting) I just usually wait until I can find something on the cheap. It's really not difficult at all to find TPs and hardcovers for 1/2 cover price or less, if you've got some patience. Let me clarify what I mean when I say comics aren't worth the price: it's not so much a criticism of the content as it is the format. The modern comic book is simply a poor value at three dollars (and a terrible value at four). Even the best books simply don't deliver enough to justify that price. Factor in that EVERY comic book is written for collections these days, and I just can't see why anyone still buys comics these days. You're paying a premium price for a shoddy physical product that, in most cases, is simply a segment of a story that takes less then five minutes to read. Comics... floppies that is... just aren't fun any more. Although, speaking of quality, I certainly have found that I've lost whatever connection to the characters that I once had. Much of today's mainstream comics- certainly the really high-profile stuff- just seems soulless. I find that I connect with the characters through things like the Brave and the Bold and Avengers cartoons, action figures, and of course Minimates! damn my lack of willpower. 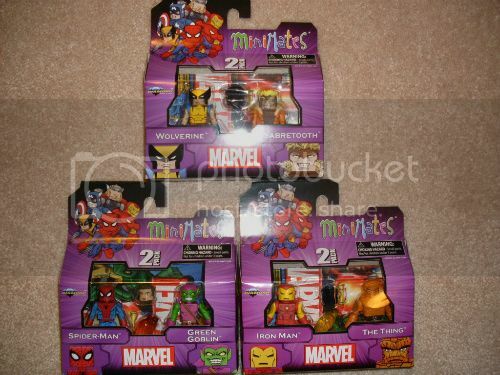 I went to just get the Iron Man/Thing set and ended up with the Spidey/Goblin and Wolv/Sabertooth sets as well. I'll post pics later today. Bad news guys. 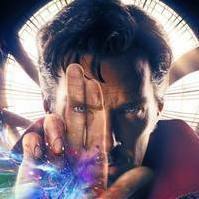 The Thing does not come with the new 3 fingered hand. It's the old one that's been used before. Sorry, but at least he is a consistent shade of orange this time around. 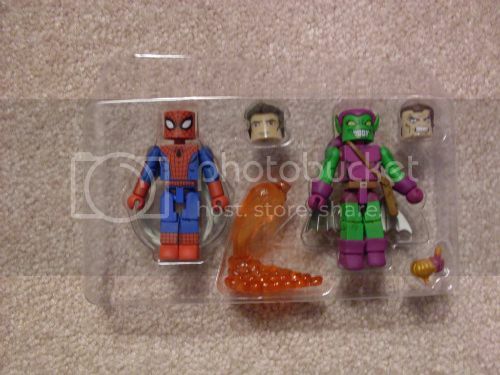 GG and Spidey each come with alternate heads. Some of you may even recall the face tampo used on Norman. I believe it was shown in an issue of Toy Fare long ago and was never used on the final product. JEEZ. That IS bad news. I feel like they keep phoning it in on any version of him that comes out. Harumph. the absolutely mental facial expression? Picked up the wolvie sabes pack and GG and Spidey. passed on Thing, as mentioned, he has his club hand, not the kronan stone man hand. Wolvie and Sabes come with the new clear circle stands, so does spidey. spidey has wing webs, but they're sculpted, so no adding them to Spider-woman. Here are the pictures. I gotta say I'm more impressed with these than I thought I would be. The colors on all of them are very bright and eye catching. 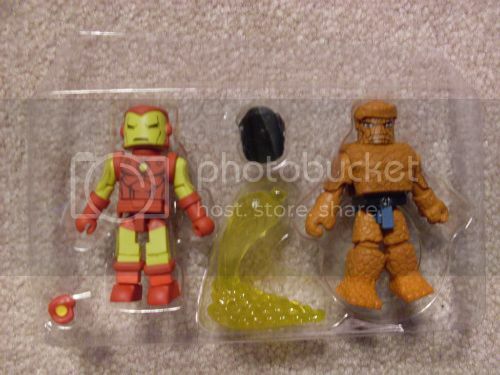 My favorite set is the Iron Man/Thing because Iron Man is actually yellow not gold. I prefer minimates of armors that were yellow in the comics to be yellow. Not gold because the yellow was supposed to represent gold. Also, DST finally got all of the colors on Thing to match, crazy Norman face from the cancelled Target figure and a new mold for the goblin satchel (it's not a purse). Thanks for the run-down and pics, fellas! SWEET. At least the Thing has the right color this time! I also really like the primary yellow/blue colors on Wolverine. I'll pick one up because of this. 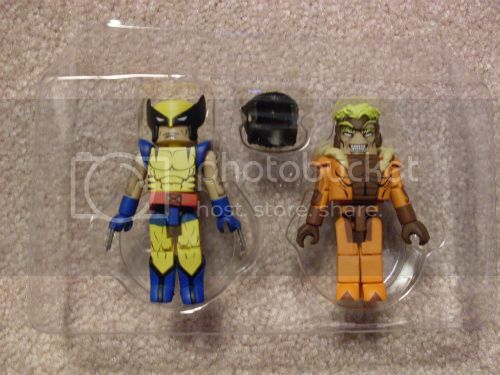 these looks so cool, very bold and bright... those are what minimates should look like! Loving the Parker head and hair, may well have to get that one now. Norman's face is definitely different from the old cancelled Target version though.